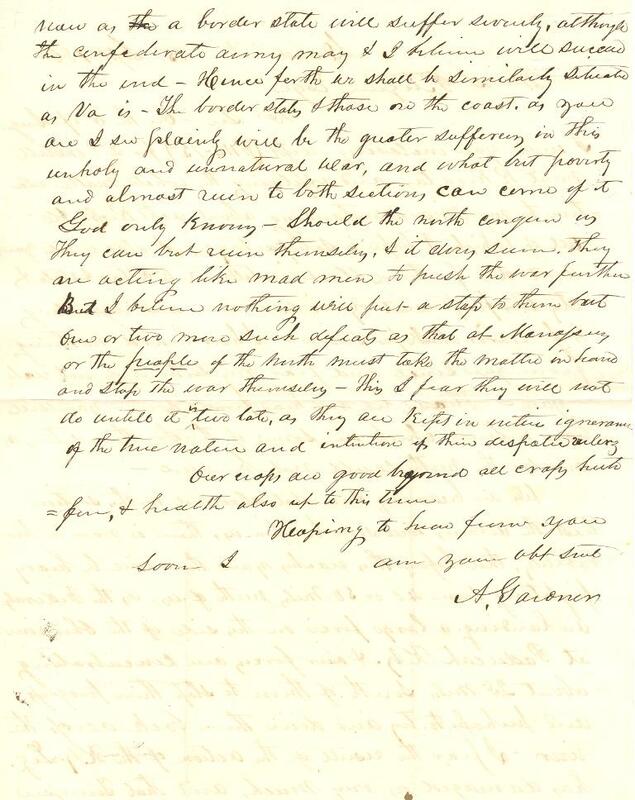 Item Description: Letter, A. Gardner to William S. Pettigrew, 15 September 1861. Item citation: From folder 246 in the Pettigrew Family Papers (#592), Southern Historical Collection, The Wilson Library, University of North Carolina at Chapel Hill. We are becoming somewhat alarmed in this section least the armies will soon be upon us, there is now a feasibility that before this reaches you there will be heavy fighting some 40 or 50 miles north of us, as the Federals are landing a large force on this side of the Ohio river at Paducah, K.Y. & our forces are centralizing about 25 miles South of there to stop their progress and perhaps to try and drive them back across the river – I fear the result of the action of the K.Y. Leg. [Legislature] has damaged us very much, and that Tennessee now as a border state, will suffer severly, although the Confederate Army may & I believe will succeed in the end – Hence forth we shall be similarly situated as Va is – The border states & those on the coast. As you are I see plainly will be the greater suffering in this wholy [sic] and unnatural war, and what but poverty and almost ruin to both sections, can come of it God only knows – Should the north conquer us they can but ruin themselves, & it does seem. They are acting like mad men to push the war further. 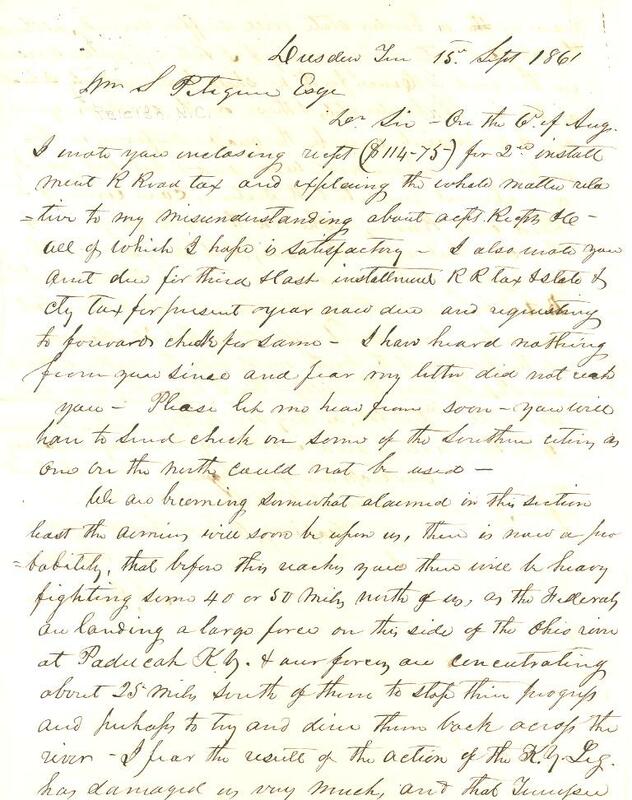 But I believe nothing will put a stop to them but one or two more such defeats as that of Manassas or the people of the north must take the matter in hand and stop the war themselves – This I fear they will not do until it is too late, as they are kept in entire ignorance of the true nature and intention of their despotic ruler. Our crops are good beyond all crops [illegible] & health also up to this time. This entry was posted in Southern Historical Collection and tagged home front. Bookmark the permalink.